We are involved in providing a broad array of high quality Wiping Glands, which are widely used in SWA, plastic and rubber sheathed cables. Perfect for indoor conditions, these glands are provided with inner ring frames for positive amour clamp and earth continuity. We also customize these glands as per the diagrams and sample designs recommended by our clients. We derive a comprehensive range of wiping glands which is fabricated from heavy duty brass materials. This range complies with BS standard BS 6121 part i 1989 and can be availed by our clients at competitive prices. Apart from the standard size, these are also offered as per the customers specifications. 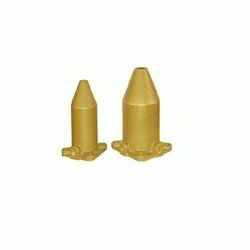 We have developed a wide range of Wiping Gland that is manufactured from heavy duty brass. Our range complies with BS standard BS 6121 part I 1989 and can be availed by our clients at competitive prices. These are made from heavy duty brass. Wiping glands are made as per customers drawings & specifications. Looking for Wiping Gland ?